The New York Times had an intriguing story yesterday on the skyrocketing price of jade in China. According to the article, the demand for jade among China’s newly rich “appears to have reached a frenzy in the past year or two.” The price of the finest jade has increased tenfold over the past decade, to $3000 an ounce, making it far more valuable than gold. I’m glad someone reporting on this trend, which I started noticing late last year. At my son’s baptism, in December, a friend of mine came from the U.S. to serve as the godfather. On his last day here in Beijing, we took him to our local department store to pick out a gift for his wife. When we looked at the jade pieces on display, we were astonished at the prices. Several modest-looking bracelets were going for over US$100,000 a piece, while only a few of the smaller items cost less than US$1,000 — and keep in mind, this was a mid-range neighborhood retail outleet, not a high-end establishment. When we expressed our surprise to the sales clerks, they said that the price of jade had surged at least 50% over the past few months. I wanted to write about this at the time, but wasn’t sure how to confirm what we had been told. Unlike gold, which can be melted down and has a fairly objective price based on weight and purity, every piece of jade is unique. Its value lies in the eyes of the beholder, and depends on more subjective evaluations of its size, shape, translucence, color, and craftsmanship. So as far as I’m aware, there’s no such thing as a “jade index,” just a more general impression of where the market stands. The channeling of China’s savings into “stores of value,” like gold or vacant real estate, that are themselves unproductive but offer people a place to stash their cash given a limited choice of alternatives. I’ve noted many times the central role this factor plays in fueling China’s property market. I’ve also noted how, when the government stepped in with “cooling measures” to rein in real estate speculation, plenty of Chinese investors switched from property to gold, which served much the same need. The rising price of jade suggests, not surprisingly, that it is also playing a similar function. Asset inflation, due to the large amounts of newly-created money sloshing around in the Chinese economy. China’s money supply expanded by over 30% last year (year on year) and nearly 20% again this year, yet economists are scratching their heads why this has not shown up in consumer inflation (at least according to official staistics, which has August CPI at 3.5%). I’ve argued that the excess money has been going mainly into savings rather than consumption, bidding up prices in real estate, gold, and (now apparently) jade, hence the latest rise in jade prices. The role of unreported “grey income” in China’s economy. A recent report by Wang Xiaolu of the China Reform Foundation, published by Credit Suisse, has attracted a great deal of attention by claiming that wealthy Chinese have US$1.5 trillion in hidden income (accounting for over 30% of GDP), presumably derived from bribes, kickbacks, or tax evasion. Portable, non-traceable assets like gold and jade are an ideal form of storing such gains — far better than bank accounts, which can be traced and confiscated, or real estate, which to avoid scrutiny would have to be registered and held through relatives or other nominees. If Wang’s study is accurate, no wonder the market for jade is booming. So far from being a curious but inconsequential anecdote from China’s far west, the explosion in jade prices — as I’ve suspected for many months now — actually confirms a much broader story about what is really happening in the Chinese economy. On an entirely different note, for anyone out there who can speak Danish, I was interviewed the other day on Danish radio about the Chinese economy. No, I don’t speak Danish — they translated what I had to say. So if you can understand it, or are just curious to hear what my name sounds like when spoken with a Danish accent, you can check it out here. I would not pretend to tell you what to do with the jade figures you own. I do think it’s worth noting, however, that the jade that has dramatically risen in price is “fine jade.” What exactly defines “fine” jade is a matter of judgment and preference, but there is plenty of “junk jade” out there that is quite cheap. The bracelets in my neighborhood department store may cost as much as US$100,000 each (I just checked them out again today), but I bought a jade “chop” the other day at the airport souvenir store for about $10. You need to find out what kind of quality jade you have, the range can vary immensely. A picture would be nice. I would hold till I had a professional check it visually to see if a GIA identification. Gook luck. I have been a collector of Jade for many years. Most of the Jade on the market has been treated or doctored to enhance the item to resemble quality Jade. There are no “cheap” Jade items that have any other value other than “cheap”. investing in Jade. The fear that paper money is becoming less and less valuable and that yields on liquid funds is extremely low, sending money to third parties whether they be funds, stock brokers or whatever form of investment financial instruments is becoming dangerous from many prospectives, including unlawful requisition. coins such as Krugerrand, Maple Leafs, US gold coins etc., and hold them in a safe place only you control, but since quality Jade is currently twice the price of gold, if you follow certain criteria it could be an option. 1. Purchase only fine quality Jade and purchase the best you can afford, you are better of with one great piece than 10 lesser quality pieces. Only the best pieces will be most marketable at the best prices. it is “natural” and untreated. 4. 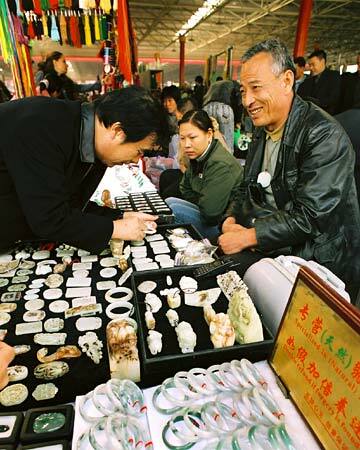 Market in top quality auctions dealing in Jade such as Christes and Sothebys because the quality market of Chinese buyer s trust these companies reputation. quality Jade from other materials on the market and remember, if it is too good to be true or real because the price is so low, then most likely it is not quality Jade. By the way this axe is light blue green…it is so weird the form it is carved…how can I apraisse this axe…this man I bought this axe from…has more objects for sale…this are arlums his grandfather gave him…. My father past away 7yrs ago & lift me a sq block of jade whitch he has had in his safe for since the Vet War, its about 2 1/2 inches wide & 3 inches long, wghs about 2 to 3 pounds. I need some help finding someone who can help me sell it, or at least what to do with it other then use it as a paper wieght.